A couple of weeks ago we started talking about myths that people have come up with about cats. Here are 5 more rumors about cats simply not true and we talk about what is true with our feline friends! -It is true that many cats will hide when a stranger comes in the home if the owner is away. This is usually due to the fact that the cat was never properly socialized as many cat owners do not consider socialization a key part of their cat or kitten’s upbringing. Cats can be very social animals, as anyone who knows my cats knows very well! Even if your cat is not very social it is important to have someone check on them everyday to ensure they are eating and drinking normally since cats can be very sensitive to changes and their health can decline quickly if symptoms go unnoticed. -A cats whiskers are important, but they are not for balance. A cat actually uses their whiskers as feelers in dim lighting and to get into small spaces. 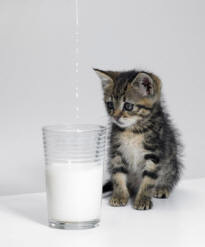 -I know kittens are adorable when they are sitting drinking milk from a saucer, but despite popular belief cow’s milk is really not good for kitties. Cats are generally lactose intolerant and the milk can give them upset stomachs which is not comfortable for them and the clean up is not comfortable for you! -Cats are crepuscular which means they are most active at dusk and dawn. This is when there are the most hunting opportunities and there is still enough light to be able to see their prey. Cats often sleep when the house is quiet during the day and no one is home and will be more active as everyone gets home in the evening throughout the night. You can help to prevent your cat from keeping you up at night by having evening playtime and setting up a routine. A cat can adapt to your routine fairly easily. Cat behavior is starting to become a better understood topic as more and more pet owners are getting a cat as a pet and want them to fit in their home and be happy and healthy. If you want to know more about cat behavior or their health and nutrition then contact us today!